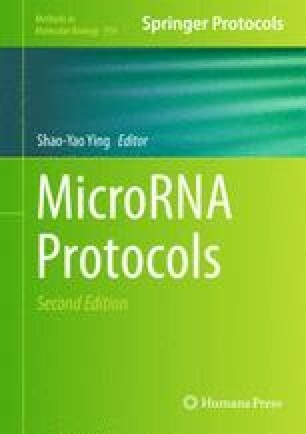 MicroRNAs (miRNAs) are ∼22 nucleotide single-stranded RNA molecules that originate from hairpin precursors and regulate gene expression at the posttranscriptional level by basepairing with target messenger RNA and blocking its translation or inducing its degradation. miRNAs play important roles in a variety of biological processes, including development, proliferation, differentiation, cell fate determination, apoptosis, signal transduction, host–viral interactions, and tumorigenesis. Methodological advances in miRNA studies allowed identification of biological roles for many miRNAs, and establishing the spatiotemporal expression patterns of miRNAs is one of the approaches to elucidate their biological functions. Expression pattern analysis of miRNAs helps to identify potential genetic interactors that exhibit similar expression patterns and this, combined with further supporting experiments, helps to identify the genetic pathways in which the specific miRNAs are involved. In this chapter, we describe a detailed protocol for the analysis of miRNA expression patterns in Caenorhabditis elegans.